The Seminole Ridge High School boys weightlifting team. 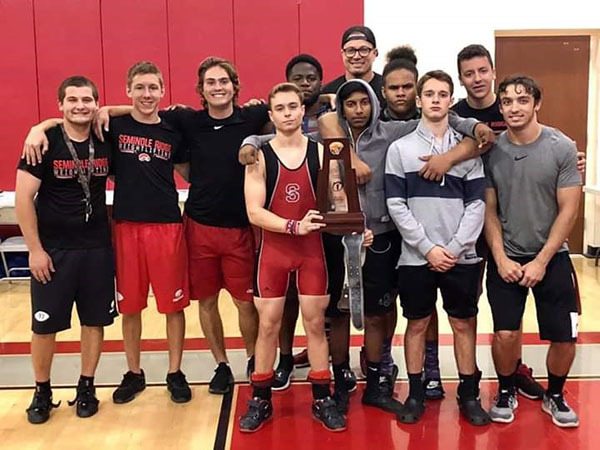 The Seminole Ridge High School boys weightlifting team won the conference, district and regional championships this season, dethroning two-time regional champs Park Vista High School. District champions included Akeem Ali (119 pounds), Jacob Campbell (129 pounds), Kevin Lanardos (183 pounds) and Peter Sinoyiannis (199 pounds). Regional champions included Jacob Campbell (129 pounds). State qualifiers included Jacob Campbell (129 pounds) and Nelson Sutton (238 pounds). Hawk Track & Field Team Wins Conference — The Seminole Ridge boys track and field team won the 2019 Palm Beach County Western Conference Championship. Conference champions included the 4 x 800-meter relay team, the 4 x 400-meter relay team, Jethro Joseph in the discus throw, Matron Thornton in the 800-meter run, Nico Pieroni in the 400-meter dash, Kailen Romer in the triple jump and Aaron Pringle in the 300-meter hurdles. Milestone for Pendergast — Seminole Ridge varsity baseball coach Trent Pendergast reached a huge milestone on Friday, March 29 when he coached his team to a win. It was Pendergast’s 200th regular season win.